Earth Jam is the largest Earth Day celebration organized by the NAU Office of Sustainability and Green Jacks to celebrate the Earth and environmental sustainability while getting some sunshine. The purpose of this event is to spread positivity about environmental sustainability, promote campus engagement, and network with students and organizations on campus and in the Flagstaff community. At Earth Jam, we plan to have a variety of interactive and informative activities, local student bands playing music, artists displaying art, yoga, slack-lining lessons, dancing, rock wall climbing, and so much more. 1. Tabling: Your club/organization's participation can be as simple as having a table set up with information about your club but we highly encourage each club to facilitate some sort of game or activity relating to the environment, (art display, crafts, games, trivia, etc.). This is great way to get the word out about your group and have fun engaging with the public. If you need some ideas for activities, we are full of them so just ask. 2. Workshop / demonstration activities: We encourage groups to organize a workshop or demonstration of some sort to grab attention and help teach a skill to every participant at the event. This workshop/demo would be an activity that happens once or twice during the event and that is not ongoing, such as yoga, DIY shampoo or cleaning product, raffle drawing, etc. We will have a schedule of things going on at particular times and will announce each workshop/demo. 3. You can do both! Become an Earth Jam Champion and have your club table and host a workshop or demonstration activity. If you are interested in hosting a Master Recycler table, please contact Dylan at dlenzen@flagstaffaz.gov or (928) 213-2158 and we can register as a participant and provide outreach materials. Drop-off day is a collection event where Flagstaff residents can properly dispose of hazardous/e-waste, tires, prescription medications and medical sharps, and sensitive documents for shredding. Sorted Office Paper (SOP) is the highest grade paper commodity sold on the recycling markets. It typically sells for approximately $200/ton compared to mixed paper at approximately $30/ton. SOP is classified as white, office-type paper but can also include shredded paper, most mail and window envelopes, and book pages. We’re organizing a drop-off day event to try and encourage people to bring this type of paper to the MRF. We need Master Recyclers to help sort the material and be sure that we don’t contaminate the load with lower-grade paper. We will also have the book binding cutter on hand to properly dispose of any books people bring. This will be a monthly event, scheduled for the first Saturday of every month at the MRF. Please RSVP Dylan at dlenzen@flagstaffaz.gov or 213-2151 if you’d like to participate or have any questions. A White-Paper Recycling effort is being started in Flagstaff. This high-quality paper is known as “sorted Office Paper” (SOP) in the recycling industry. It brings about $200/ ton compared to its alternate disposal as “mixed paper” of $30-$50/ ton. Initially there will be a monthly drop-off day on the first Saturday of the month from 9-12 am (the day after the MRF Tours). It will be managed by Master-Recyclers to quantify deliveries and do quality assurance. This will also be an opportunity to talk to people about recycling and particularly about “contamination” and why the term is now at the center of all recycling discussions. This SOP project is an extension of what some of us did in collecting the same white-paper for SCA Tissue before it shut down. They had the same specifications. The basic rules for SOP are: No brown paper, no coated (glossy), and no large areas of colored printing. Staples and window envelopes are OK. A more detailed discussion of the quality is at the bottom of this note. One feature we can tout to the public is that the SOP will be quickly baled with less exposure to prying eyes than disposal in curbside bins. The City of Flagstaff shares the earnings from sales of recyclables with Norton Environmental. Next to aluminum, SOP is the most valuable recycled product. For SOP the increased value brings a net $70/ton to the City. SOP is already being collected by Norton from Iron Mountain Shredding. These shreddings are sold as SOP. Although we are starting with what we individually collect, we expect to expand the effort to include NAU, schools and other locations with significant SOP supplies. We hope that some Master-Recyclers will contact these places and make arrangements to bring their paper to the drop-off or perhaps make “collection runs” on First Fridays. Let us know if you are interested in this portion of the project, and if you have other ideas. On “First Saturday” collection days one or more MRs will monitor the collection process at the MRF. The main purpose is to prevent contamination, but we will want to weigh deliveries to quantify the benefits of the program. It is also a great opportunity for outreach, even for non-SOP drop-offs. These drop-off events are likely to be lonely for several months, so we are planning to add the book recycling effort to the event. We will process any books from the library destined for destruction as well as additional drop-off. Some of the book paper will contain SOP and the remainder can go into the mixed paper bin. 5. Minimize red printing – It carries into the final product worse than other colors. A little is OK.
7. White cardboard is OK. Tear it to see if it is white inside. Often used in medical packaging. • Consists of printed or unprinted sheets, shavings, and cuttings of colored or white sulphite or sulphate ledger, bond, writing, and other papers which have similar fiber and filler content. Contains less than 10% color. This grade must be free of treated coated, padded or heavily printed stock. A percentage of carbonless paper and groundwood is allowable. • Prohibitive materials may not exceed 1/2 of 1%. When we saved paper for SCA Tissue they could take most white material including window-envelopes and card stock that was white inside when torn. Prohibited was any brown paper like newsprint or brown cardboard. Join the Azulita Project by providing outreach related to single-use plastic at the Farmers Market. Promote reusable items by sharing the BYO (Bring Your Own) campaign and inform residents about changes to plastic recycling. You are welcome to volunteer for all or part of the market. If interested, please reach out to Dylan at dlenzen@flagstaffaz.gov or 928-213-2158. We're always looking for help at our Fix-it Clinics, whether you are a master fixer or not. We could use help not only as fixers, but also as general help and providing recycling outreach. If interested, please contact Maggie Twomey, mtwomey@flagstaffaz.gov. If interested, please contact Felix Parham, fparham@flagstaffaz.gov or 928-213-2151. The Hub has finally implemented a recycling program for their residents and is hosting an event to educate them on the proper procedures related to recycling in Flagstaff. We will be assisting Erika Bert, an NAU Honors Student who spearheaded the effort to implement this program, by handing out signage and educating residents about proper sorting of recyclable materials. Please contact Felix at fparham@flagstaffaz.gov or (928) 213-2151 if you’d like to participate. The 2nd Annual Youth Climate Summit is being held on April 16th at the Arboretum. The Sustainability Section is hosting the event with The Arboretum and Willow Bend. The Summit will feature KidWind, Climate Action, and Solar Structure Challenges, along with a Sustainability Expo. We have a volunteer opportunity for Master Recyclers to host the Waste Wheel game and inform kids and parents alike on updated recycling policies. You can also take time to check out all the cool activities the kids are doing. We can register to have a Master Recycler table if people are interested. Please contact Felix at (928) 213-2151 or fparham@flagstaffaz.gov if you’d like to host a table for the whole day, or just a few hours. This will be a monthly event, scheduled for the first Saturday of every month at the MRF. Please RSVP Felix at fparham@flagstaffaz.gov or 213-2151 if you’d like to participate or have any questions. Come out and celebrate the graduation of the 2019 Master Recycler class.! We will be meeting at Charley’s Pub & Grill at 7:30 pm after the conclusion of the final class. This will be a great opportunity for everyone to meet and share ideas for upcoming projects. Please feel free to bring your family along too. STEM Night at the NAU Skydome is a huge event every year with thousands of people attending and learning about all things S(cience) T(echnology) E(ngineering) M(ath). We have an opportunity for Master Recyclers to work at the Sustainability Table and be mobile Ambassadors. We will work to get out the message that Materials Management and Recycling Infrastructure in general are great examples of STEM fields in action, both presently and into the future. The 2019 Master Recycler course field trip to the NAU Food Recovery & Compost Program is open to previous students as well. Come out and learn about how NAU is able to divert ALL of its food waste from the landfill. Pre-consumer waste is collected and donated to area food banks, while post-consumer waste is ground up and sent to the Compost field. The Compost field is divided into 2 areas, one for food waste and the other for green waste. Get an up close tour of the operation and see how they make rich, valuable compost from their waste. Please RSVP to Felix at fparham@flagstaffaz.gov or 928-213-2151 if you’d like to attend. The 2019 Master Recycler course field trip to the Cinder Lake Landfill and the Hazardous Products Center is open to previous students as well. Come out and learn all about the valuable services offered and upcoming plans from City of Flagstaff Solid Waste Director, Todd Hanson. Please RSVP to Felix at fparham@flagstaffaz.gov or 928-213-2151 if you’d like to attend. Aspen Sports is hosting a BYO/Sustainability promotional event on Homecoming Day and would like your help. We need a few volunteers to promote sustainable BYO practices, provide information to the public, and promote the upcoming 2019 Master Recycler course. Aspen Sports is a partnering business with the BYO campaign and will be having a sale on durable, reusable goods including Hydro-Flasks and water bottles. They will also have a water filling station on-site. Please contact Felix at 213-2151 or fparham@flagstaffaz.gov if you would like to participate or have any questions. Contact: Felix Parham, fparham@flagstaffaz.gov, 928-213-2151. Promote reusable items by sharing the BYO (Bring Your Own) campaign and inform residents about new changes to plastic recycling. The table will be set up near the recycling and trash bins, so you'll have plenty of opportunities to talk to residents about what they are throwing away. If you'd like to do B.Y.O. or recycling outreach at the market, please email Dylan at dlenzen@flagstaffaz.gov. The Azulita Project might also be tabling and talking to residents about impacts of single-use plastic. If you'd like to table specifically with the Azulita Project please email Laine Giovale at lainiegiovale@gmail.com. Interested in learning more about the Azulita Project and how you can use your volunteer commitment to support their mission of reducing single-use plastic in Flagstaff? 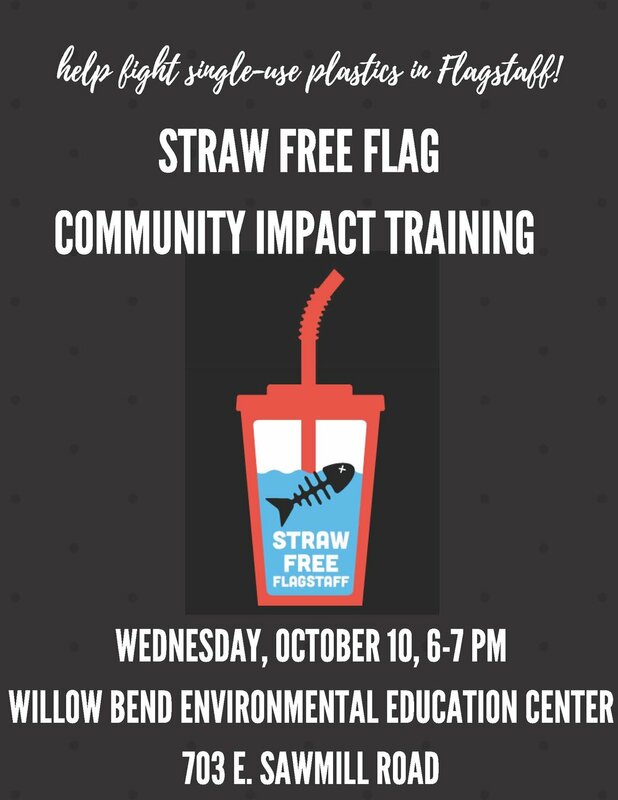 On October 10th from 6-7 pm at Willow Bend, members of the Azulita Project will provide you with background on their organization and discuss how you can support their efforts to get local restaurants to reduce their usage of drink straws and other single-use waste. If you have any questions, feel free to reach out to Dylan at dlenzen@flagstaffaz.gov.